Seasonal allergies & common cold are very similar, click here to read! 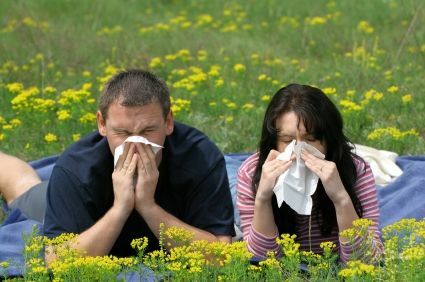 When it comes to seasonal allergies, there is no seasonal allergy humor, just Seasonal allergy symptoms – Spring has arrived and already left allergy sufferers with a runny nose, seasonal allergy headache, seasonal allergy symptoms body aches, itchy eyes, as well as other symptoms of hay fever. Hay fever has symptoms that closely resemble those of the common cold. It is for this reason that many allergy sufferers are not getting professional help. “Uhh, I just have a cold,” is the thought that runs through most people’s minds. What people don’t seem to realize is that the longer one is in the presence of an allergen, the worse the symptoms become. An allergen is a substance that causes an allergic reaction. For example, pollen is an allergen common to many people. Due to the serious consequences an allergy can have, diagnosis is very important and then you must proceed with getting seasonal allergy medicine. In general, allergies tend to occur in the spring and fall, whereas colds tend to occur in the winter. In addition, even though the symptoms of allergies and the common cold are pretty much identical, the occurrence of the symptoms varies. For example, with allergies, people tend to experience symptoms all at once. When one has a cold, symptoms tend to progress. For example, a sick child may first experience sneezing and then become congested over time. Despite the information provided above, seasonal allergies and the common cold can be very difficult to distinguish between. Thus, making professional care necessary. Diagnosis of allergies consists of a physical exam. Where can I get a seasonal allergy shot? Just visit your doctor Skin tests are usually performed to test for allergies. Once the cause of the allergy is found, a doctor can proceed in terms of allergy treatment. Seasonal allergy symptoms – The skin tests cause little discomfort unless there is a positive reaction to the allergen. A positive reaction means you are allergic to the particular allergen tested for. A negative reaction to the allergen indicates that the allergen has no effect on you. It is recommended that people get tested if they are not sure what they are affected by.